(Panama City, 31 March 2017) Today sees the opening of a Regional Collaboration Centre in Panama City, to be operated by the United Nations Framework Convention on Climate Change (UNFCCC) secretariat in partnership with CAF - Development Bank of Latin America. The centre will strengthen support given to countries in Latin America to help them with the implementation of the Paris Agreement and has moved to Panama City from its previous location in Bogota. 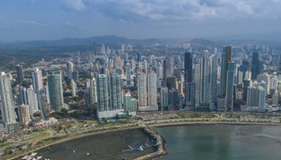 With Panama City being a major regional hub for the United Nations and other developmental agencies, the centre is expected to be a key player in catalyzing, supporting and leveraging climate action at the regional and national level while continuing to focus on work related to sustainable development through the UN’s Clean Development Mechanism (CDM). The Regional Collaboration Centre has opened in conjunction with the new International Center for the Implementation of REDD+ (ICIREDD+), an international centre for the achievement of emission reductions through the avoidance of deforestation and soil degradation. Isabel de Saint Malo, Vice-President and Chancellor of the Republic of Panama said of the opening “The ICIREDD+ and RCC Panama are key elements in the successful roadmap to prevent temperature to increase beyond two degrees Celsius, to facilitate international cooperation and the investment flows that our country needs to transform its development model into one that values the natural resources and ecosystem services that make life possible." Mirei Endara, Minister of Environment of the Republic of Panama, stated that “The centers we inaugurate today, ICIREDD+ and RCC Panama for Latin America, are a fundamental part of the international effort to tackle climate change, because they help catalyze local, national and regional action for an effective implementation of the Paris Agreement." The UNFCCC secretariat has established a number of RCCs over the last four years in collaboration with regional organizations. The first centre in Lomé, Togo, seeks to serve West and Francophone Africa on the ground, while the second in Kampala, Uganda, assists the rest of Africa. A third was established in Saint George’s, Grenada, to cover the Caribbean region, and a fourth was set up in Bogota, Colombia, in Latin America. The most recent center was opened in Bangkok, Thailand, to serve the Asia-Pacific region. RCCs aim to catalyze climate action on the ground, with the view to working towards implementing the Paris Agreement and the Sustainable Development Goals. Moving the RCC to Panama City will allow for a greater efficiency towards these goals, as it will be joining and contributing to a larger network of development agencies also working on climate change issues. Since its inception in 2013, RCC Bogota has successfully assisted countries in various ways, including, for example, by facilitating matchmaking on the ground between donor countries and project developers seeking funding, developing climate policies and supporting 210 CDM projects in the region with a view to achieving climate mitigation, sustainable development and other co-benefits. Gradually, the RCC broadened its scope and provided more services to its region. After the adoption of the Paris Agreement, the RCC took the initiative to gather experts and launch a dialogue on the implementation of the agreement which resulted in a report focused on the specific needs of Latin American countries. The mission of CAF, Development Bank of Latin America, is to promote sustainable development and regional integration by means of financing projects in the public and private sectors, providing technical cooperation, and other specialized services. Created in 1970, it is made up of 19 countries, 17 Latin American and Caribbean, together with Spain and Portugal, and 13 private banks, it is one of the main sources of multilateral financing and an important generator of knowledge for the region.